The Proper Bostonian Quilters Guild has a mini quilt show, The Modern Quilt, at the West Roxbury branch of the Boston Public Library. The show opens at 6 PM this evening and closes at 3 PM on Saturday, November 15, 2014. Click the link above for a flier for the show. This show features the quilts made by the members of the guild for the 2014 summer challenge. Quilts had to have a Modern Aesthetic, and quilts under 24 x 24 inches were required to incorporate a fat 1/16th of the Pantone color Radiant Orchid (Cerise if you speak Kona cotton). The show is free. If you are local, I hope you'll stop by and see our quilts. Here is a time lapse sequence of the show being hung this afternoon. Jeannette, who is a brilliant show manager, always makes a paper show diagram using photos of the quilts being hung. The photos make it very clear where in the show each quilt is to hang. This particular show is being managed by Susan. She used Jeanette's photo page layout today. It's a great system! 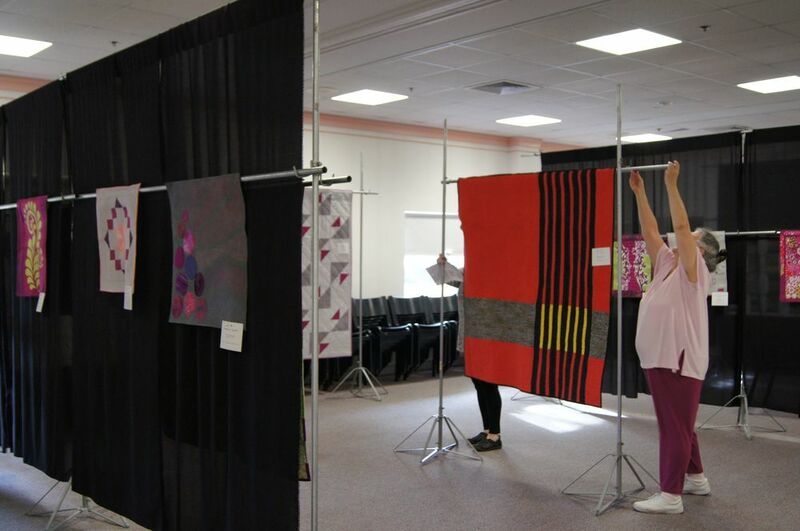 Take home message from the team that hangs the quilts for a show: Make sure the quilt you are entering has a sleeve sewn on it that extends along the entire top edge of the quilt. And make sure it meets the requirement for width. If the show's manager asks for a 4 inch sleeve, it needs to be 4 inches wide. Really! Here is one of the quilts in the show. The pattern, "Flying Birds" is my design. The quilt was made by Janet Hanley. I've previously posted this pattern as a smaller baby quilt. Here it is a generous lap quilt. It's much easier to see the motion in this larger quilt. Thanks, Janet, for permission to post your beautiful creation!